Fix some compatibility issues with audio alarm playback in newer browsers. Option to change HTTP server port. You can change the port used by the Stoker HTTP server by using a menu option on the front panel, under “Main -> System Info -> Port”. The range of valid ports is 1 – 65535. This is fairly large range so just hold down the + or – buttons and it should jump from 10’s to 100’s to 1000’s. The default port is 80. Fix issues with some ethernet switches. This addresses the issues from the previous post. A few minor updates for speed. The Stoker will send back the JSON response wrapped in parseResponse. 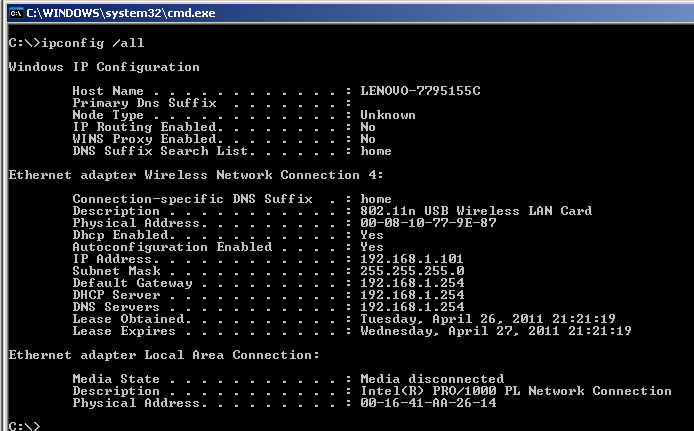 These settings can be found on a Windows machine using the command ipconfig /all at the command prompt. The /alloption is necessary to show the DNS server. This should be run on the same physical network the Stoker is on. Update Twitter capabilities to handle twitter.com’s retirement of Basic Authentication in favor of OAuth. Twitter is migrating to a new authentication method called OAuth. This is a clever algorithm that allows bits of user data (pictures, videos, tweets, etc) to be shared between sites and applications without having to share usernames and passwords. Unfortunately, this is all a bit too much for the stoker. The big roadblock is implementing the SSL support used by the algorithm. SSL is the technology used to make sure all your online purchases are secure. The solution I’ve found is to use a service provided by www.supertweet.net called MyAuth API Proxy. This acts as a middle man between the Stoker and Twitter. Now twitter is requiring OAuth. The fat arrow is an attempt to show a more robust connection between the client and twitter. The solution is the middleman www.supertweet.net. Go to twitter.com and logon with your Stoker only account (you are using your dedicated stoker account, right?). Keep the tab open. This will redirect you to twitter.com and you will be presented with a Deny/Allow page. Allow. This will then redirect you back to supertweet.net. Click on “Activate”. Choose a new password. DO NOT USE YOUR TWITTER PASSWORD! Enter the new password into the password field. Click Save Changes. During this whole process, you should have only used your true twitter password once to log onto twitter.com. This is the whole point. So now, not even the Stoker knows the twitter password. The system works. The one gotcha is that we are now dependent on supertweet.net to honor our privacy and not do anything malicious with the regular temperature updates. Sounds stupid, I know. I mean, it’s all public anyway. But just something to consider. To “POST” data, the JSON body should look exactly like the Stoker object above. The only difference is that the “POST” handler will ignore the read-only attributes. For the sensor entries, the POST handler will ignore the tc field. For blower entries, the POST handler will ignore the on field.